Firstly, I would like to wish you a very happy new year!. Who knows what January has in store for us, it was certainly a stormy start to December. January is a time of planning and preparation for the Spring and Summer to come. If you can brave the elements, here are a few things to be getting on with. Get planting, yes, really!. Although the air temperatures are low, the soil will still be retaining some warmth. Unless the soil freezes or we have heavy snow, January is a perfect time to plant. Transfer or purchase snow drops ‘in the green’. Often neighbours are happy to share theirs if they have a glut. Plant or fill gaps in hedging and add trees and shrubs to your plot. Bare root trees, hedging, Roses. Azaleas, Camellias and Rhododendrons all do well if planted at this time of year. Summer bulbs are also worth ordering now through a nursery or on line, gladioli and dahlias are great bulbs for adding impact in the border without costing the earth. If you have windowsill space or a greenhouse, sow some sweet peas for early summer flowers. Be cautious when clearing leaves and pruning this month as you may find wildlife hibernating or sheltering there. 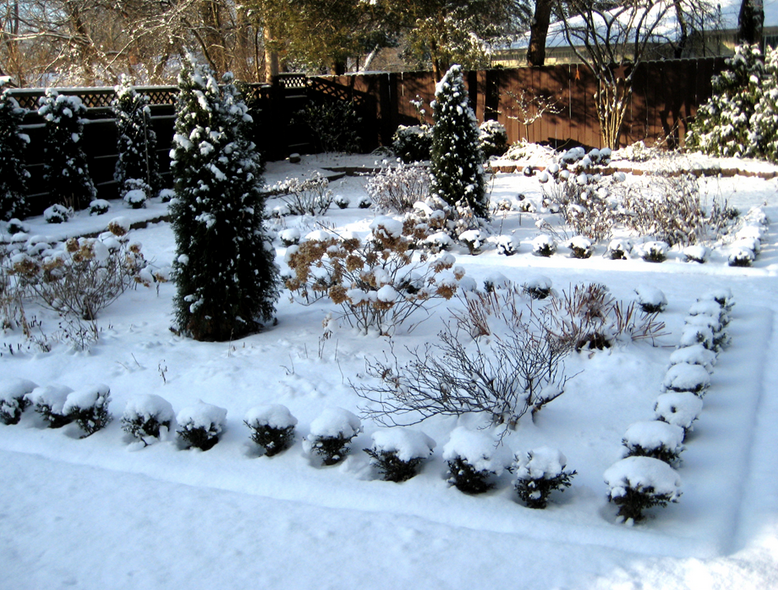 Perennials can be cut back to just above ground level now that they are dormant. Shrubs such as Buddleia can be pruned back hard now, you may also remove any very old stems. This will increase the amount of flowers this season. Thin out and prune apple and pear trees, cut back any new growth to one or two buds. Late flowering Clematis can be pruned now, either down to a foot or so from the ground if you are happy to keep it compact, or shorten all side shoots to one leaf joint. If your roses didn’t flower particularly well last year, try cutting them back quite hard, mulch them with a well rotted manure and remove any branches which rub or cross over others. You can also train short climbers along wire, this will result in new shoots from the horizontal branches and plenty of flower buds. If you haven’t already, mulch your borders. You can use compost, rotted manure or leaf mould. Put on a good thick layer, this not only provides your plants with nutrients it also protects them from harsh temperatures and prevents on onslaught of weeds come Spring. Take time to go through all the mail order brochures that arrive at this time of year. Pre-ordering small plug plants now can provide excellent savings. Seeds and bulbs can also be pre-ordered, allowing you to plan an amazing display come late spring and summer.